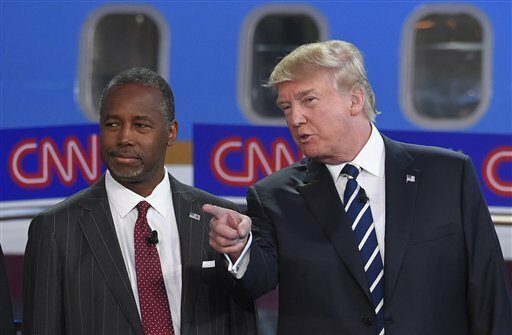 By Amy Sherman on Thursday, September 17th, 2015 at 2:43 p.m.
Ben Carson and Donald Trump discussed vaccines during the CNN debate Sept. 16, 2015. CNN’s Jake Tapper noted that a backlash against vaccines was blamed for a measles outbreak in California. Meanwhile, Donald Trump has linked childhood vaccines to autism despite the medical community debunking that myth. During the second GOP debate, Tapper asked Ben Carson, a retired pediatric neurosurgeon who now lives in West Palm Beach, if Trump should stop making such a claim. Carson said Trump should look at the evidence, noting that there is "extremely well-documented proof that there’s no autism associated with vaccinations." "But it is true that we are probably giving way too many in too short a period of time. And a lot of pediatricians now recognize that, and I think are cutting down on the number and the proximity in which those are done, and I think that’s appropriate." Are pediatricians cutting down on the number and proximity of vaccines? As for Trump’s claim about autism, as PolitiFact has noted before, decades of epidemiological research have demonstrated autism rates do not increase when vaccines are introduced to a population. We contacted Carson’s campaign to ask for his evidence and did not get a reply. Doctors follow a childhood vaccination schedule prepared by the U.S. Advisory Committee on Immunization Practices. Children may receive as many as 24 immunizations by their second birthday and may receive up to five injections during a single doctor’s visit, according to a 2013 paper by The Institute of Medicines of the National Academies. That vaccine schedule is also supported by the American Academy of Pediatrics and the Centers for Disease Control. More than 90 percent of children entering kindergarten have been immunized with recommended vaccines in accordance with this schedule. But some parents have sought to delay vaccines or reduce the number given per visit, while others have rejected them entirely, despite recommendations by the scientific community. That’s not a good idea, according to the report. "Delaying or declining vaccination has led to outbreaks of such vaccine-preventable diseases as measles and whooping cough that may jeopardize public health, particularly for people who are under-immunized or who were never immunized," wrote researchers. The researchers also concluded that there is "no evidence that the schedule is unsafe." "Claims that vaccines are linked to autism, or are unsafe when administered according to the recommended schedule, have been disproven by a robust body of medical literature. It is dangerous to public health to suggest otherwise," wrote Karen Remley, executive director of the academy. Despite the scientific consensus, pediatricians are facing pressure from parents to delay vaccines. A survey of 534 pediatricians done for the American Academy of Pediatricians in 2012 showed that 93 percent reported that within a typical month some parents asked to spread out the vaccinations. The vast majority thought these parents were putting their children at risk for disease but thought they would build trust with the families if they agreed to the request. While there is anecdotal evidence that some pediatricians have acquiesced to parents’ requests to delay vaccinations, that decision is not rooted in public health or science. "There is no evidence that pediatricians 'recognize' that we give too many vaccines in too short a time," said Mark Schleiss, division director of pediatric infectious diseases at University of Minnesota. "Far from it. ... There is no evidence at all that spacing vaccines out or changing the schedule would improve health or help children." Eugene R. Hershorin, chief of the division of general pediatrics at the University of Miami, pointed to what happened a decade ago when England and Japan delayed the DTaP vaccine, a combination vaccine used to prevent diphtheria, tetanus and pertussis. "There was a tremendous increase in the incidence of pertussis in both countries, leading them to re-institute the schedule immediately," he said. Carson said pediatricians have cut down on the number and proximity of vaccines because they recognize there have been "too many in too short a period of time." Leading medical organizations have concluded that the scheduling of vaccines -- including multiple ones at once -- is safe. While there is evidence that some parents ask pediatricians to delay vaccines, that’s a decision based on parents’ wishes and isn’t based on scientific evidence. There is no evidence that pediatricians are cutting down the number and proximity of vaccines based on any conclusion by them that there have been too many in too short a period of time. Carson has provided no evidence to support his claim. We rate this claim Pants on Fire. Published: Thursday, September 17th, 2015 at 2:43 p.m.